Perched on a corner lot amongst flowering gardens is this warm, inviting and lovingly cared for home w/3 flrs of ideal living space.Conveniently located for a nice stroll to QA Ave or across the Fremont Bridge for the Sun. flea mkt. Circ flr plan allows for easy living/entertaining. Enjoy a gorgeous brand new kitch w/ss appl, granite counters, subway tile backsplash, fml d/r, liv rm and 1/2 bath on main. Above are all 3 bdrms and full bath. 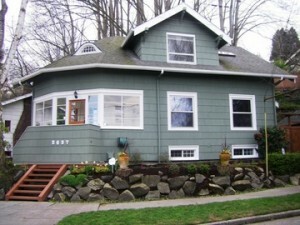 Below is fab rec rm, 3/4 bath and utility. Fab!